This time last year, I had a smile on my face that I nobody could take away from me. Jason and I had just recently celebrated being together for a year and he surprised me with a trip to Europe. I had never been, so I was on top of the world about getting to experience this amazing trip with an even more incredible guy. We were taking a cruise that stopped every day in a different port. The first stop, Malta, a small island south of Italy. Our sail-in was right at sunrise. So we set our alarm just to be able to see the beautiful sail in. And holy moly, was it beautiful! We later found out that Malta has one of the most beautiful sail-ins in the world! But what was even more special about Malta is that Jason’s heritage. His grandparents lived on this stunning island for years before moving to the states. And as we got off the boat and started roaming around. It was amazing to see all the different DeBono shops. There was a DeBono Bakery, DeBono Jeweler, DeBono Tailer, come to find out DeBono is a very common last name in Malta. It would be like Smith in America. We were up early to watch the sail-in so we were one of the first off of the boat. It was a Sunday, so most of the town was closed, but we did find a little cafe that was open. We had a pastry and cafe and then continued to roam around. After a little while, Jason mentioned that there was a beautiful outlook garden that he wanted to check out. We walked in and the view was breath taking! I did notice a photographer with all of his gear sitting on a bench looking out into the water. And I remember thinking, I totally get it. Yea, I bet he gets some awesome shots here. We went up to the rail and looked out for a moment and then that same photographer came up to us and asked to take our photographer. This part is a little embarrassing for me.... but all I thought was two things..."Man! We must look really good today!" and "I hoping we would be able to get these images from him!" Why is this so embarrassing? I have done secret proposal shoots and should have seen this coming but no...silly me...seriously had no idea. Just being completely vain and blonde! A couple clicks into the photos, Jason pulls out a box and begins to get down on one knee. Proposals are my absolute favorite!! It’s always my first question when I meet new couples. I just love hearing all the different stories! 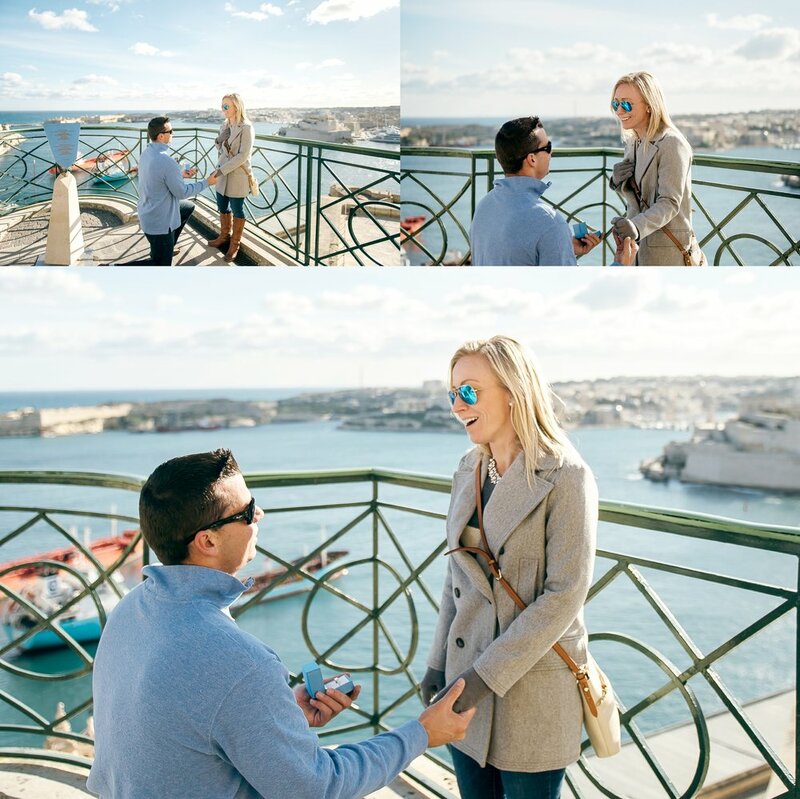 And I know I am biased, but it was the BEST PROPOSAL EVER!! 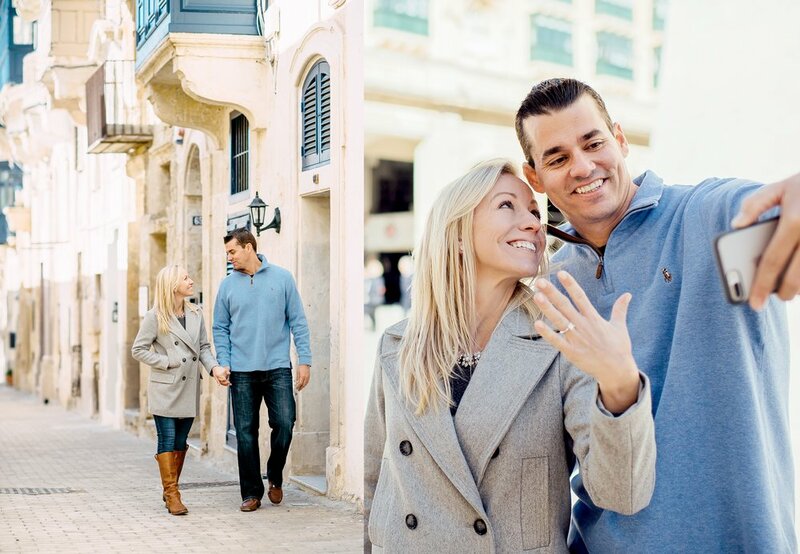 Jason found an amazing photographer in Malta, Shane P. Watts and set the whole thing up! And the fact that he did it in such a special place...ugh! How could it have been better?!? We had the best time on the trip celebrating the entire time. I would pinch myself but I’m too scared I’ll wake up!